Just yesterday, we got to see the first press renders of the second-generation Nexus 7 tablet coming with an extremely sharp 1920 x 1200-pixel 7-inch display. We also heard about its affordable prices, starting from $229 for the basic model. 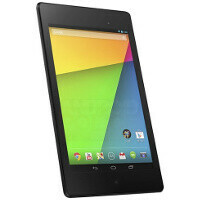 Now, the full set of press images has leaked out and you can take a look at the new Nexus 7 in its full glory. The tablet has become narrower, but longer on the y axis, compared to its predecessor. On the back, the Nexus logo has turned larger and vertical. A rear camera (allegedly, a 5-megapixel one) has appeared. On the front, a notification LED light surfaces. There are changes under the hood with Google and Asus now going for a Qualcomm chip instead of the Tegra used in the first-gen Nexus 7. Good news is that all those rumors will be coming to an end on Wednesday, July 24th when Google is expected to officially unveil the second Nexus 7. Stay tuned for our coverage of the event. July 24th... This tablet has the potential to be a critical hit. Yah it is the unveiling of the first Nexus 7 but unlike now it will be earlier. That was a weird type. July 24th it is. As close as we are to the unveiling, as unfortunate as it is, I think this is pretty much it. Thin bezel? Forget that, look how ugly that wallpaper is! Seriously, I hope they aren't gonna use that. Jesus christ! Seriously, the wallpaper was the bigger issue here? Please tell me that was sarcasm. I was pretty set to buying one ... now not so much anymore purely because of the extra large bezels at the top and bottom. first gen nexus 7 was already testing my limit on the bezel sizes and this new one is pushing it too much. Looks like a SIM/SD card slot in #6. Probably SIM, because Google isn't known for their SD cards anymore. I hope the $ 229 unit has 3G too. I think the October date is a typo considering everyone says it's supposed to launch July 31st. Apple is still trying to figure out how to sale a retina mini without damaging the 9.7" iPad any further. Don't be surprised if a retina iPad mini cost more than the current mini whenever it's released. Nice, a lot of bezel for wider and thick hands.